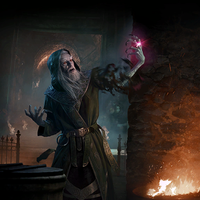 Barilzar was a powerful wizard mostly interested in portal magic and Dwemer mysteries. For a time, He was a Clockwork Apostle and studied with Sotha Sil in his Clockwork City. 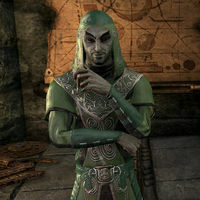 There he would learn many things and was even entrusted with a device created by Sotha Sil called the Seht's Affect Inducer, a magical device that can manipulate a person's emotions. 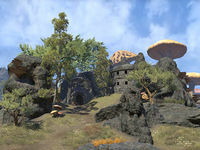 Afterwards, he moved out of the Clockwork City to an ancient Velothi tower called Odirniran in the Azura's Coast region of Vvardenfell, where he continued his research and performed his experiments. 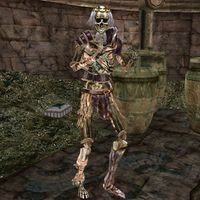 Barilzar played a prominent role in thwarting Clavicus Vile's plot to gain access to the Clockwork City around 2E 583. When Vivec began to lose his divine energy, he allied himself with the Soulless One and sent them to Barilzar's tower to obtain information. Barilzar suggested that the staff which Sotha Sil created as part of his research of the Tribunal's divine powers, Sunna'rah, might be responsible for Vivec's loss of energy. Later, when the Soulless One learned that Sunna'rah was in the hands of the young Urshilaku Ashkhan Conoon Chodala, Barilzar provided a way to defeat him: he invented and built a tonal inverter, a device capable of disrupting the staff's power, from the parts recovered by the Soulless One from the Dwemer ruins of Galom Daeus, Nchuleft, and Arkngthunch-Sturdumz. The Soulless One and Chodala's sister Seryn defeated Chodala and retrieved Sunna'rah. When they returned to Vivec and used it to return his divine powers to him, it instead drained most of his remaining power, transferring it to the Clockwork City. This almost caused Baar Dau to fall from the sky, as well as made the Red Mountain rain fire onto the Vivec City. This turn of events was revealed to be a ruse orchestrated by Archcanon Tarvus, who in reality was Barbas, Clavicus Vile's loyal servant, who took the form of the late archcanon. The sudden transfer of most of Vivec's divine energy to the Clockwork City "lit it up", which allowed Barbas to discover its location. He traveled there to make final preparations for Clavicus Vile's arrival. Barilzar and the Soulless One soon followed. Barilzar took the Soulless one to Seht's Vault beneath Mournhold, where the City - in reality a tiny clockwork structure about the size of a large crate - was located. Barilzar and the Soulless One shrunk themselves and entered the City, then fought their way through the fabricants guarding it to finally reach Barbas. The Soulless One defeated Barbas before he could allow Clavicus Vile to enter the Clockwork City. Afterwards, Barilzar and the Soulless One returned to Vivec and gave him back his divine energy. With Vvardenfell safe, Vivec rewarded everyone who took part in stopping Barbas and Clavicus Vile, including the Soulless One and Barilzar, who subsequently returned to his tower to continue his research on the portal magic. At some point later in the Second Era, Barilzar created a powerful artifact, the Mazed Band. It was primarily a device used for teleportation, but it also had the ability to "destroy the hearts and minds of mortals", as well as to open gates to Oblivion and summon "hellish creatures best left in a nightmare". It was considered an evil and cursed artifact and was supposedly stripped of its power so only a god could take advantage of its full power and not be destroyed. Barilzar regretted creating the Mazed Band and transformed himself into a lich to guard the artifact for all eternity. It is unknown whether it was his own decision or a form of punishment exacted by the Tribunal. Journals written by Barilzar in the Second Era hint that it was his own choice however. Some also believed that the Band itself did it to him. From this point on, Barilzar and his Mazed Band dwelled in an abandoned crypt beneath Mournhold. He remained there until 3E 427, when Almalexia, driven mad by the loss of her divine powers, sent the Nerevarine to retrieve the Band for her. The Nerevarine fought Barilzar in the crypt and defeated him, ending his life for good. He then returned the ring to Almalexia, who used it to summon Sotha Sil's fabricants and unleash them upon Mournhold. Afterwards she sent the Nerevarine to the Clockwork City to stop Sotha Sil, whom she blamed for the attack. Unbeknownst to the Nerevarine, Sotha Sil was already dead by Almalexia's hand, and the purpose of the mission was to have the Nerevarine killed by the Clockwork City's defenses. However, the Nerevarine made it to the Dome of Sotha Sil, where he discovered the living god's body. At this moment Almalexia appeared to personally finish the Nerevarine, but he was stronger and killed her. Barilzar's Mazed Band allowed the Nerevarine to escape the Clockwork City, and he could use it to instantly travel between Vivec, Mournhold, and the Clockwork City from that point on. This page was last modified on 20 October 2018, at 23:34.